If I have the time, I like to read the plaques on the benches around the city, or wherever I see them, on buildings, church pews, at the base of trees. I think I’ve posted pictures of them from time to time. I love reading these small dedications. 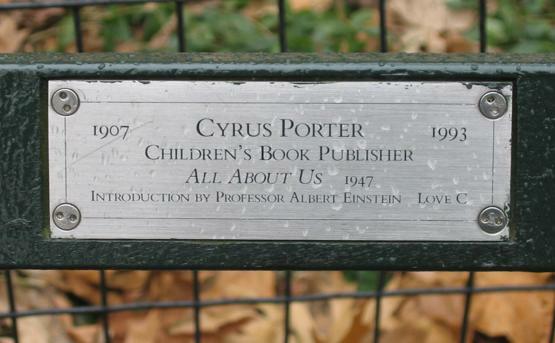 I couldn’t find out much of anything about Cyrus Porter. I wonder who “C” is? But All About Us is a children’s book by Eva Knox Evans about why people are different, and have different skin color. According to the New York Public Library listing she’s still alive, but she’d be 102 if that’s correct. There’s a copy at the library way way uptown, but I’m curious to read what Einstein said, and there’s something else I needed to check up there. Maybe I will make it up there sooner rather than later. I love those dedications too. Still doesn’t explain the “C” though. I am also interested in the thief-proof screws used to hold the plaque on to the bench. Although… it looks like you could almost use the tool you use to tighten the spikes on golf shoes. Those screws are called either ‘spanner head’ or ‘snake eyes.’ Same principle as golf spikes, tho’ the screw heads are much smaller. Okay, how do you know stuff like that, David? ?